Biggar head coach Gary Mercer is moving into his third season with the club and his aim is once again to gain promotion. 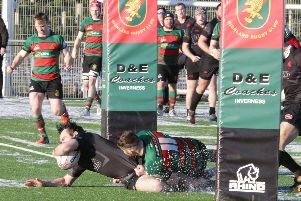 Currently in the third tier, the Tennant’s National League Division Two, Mercer’s objective for this season, as with the last two, is to help Biggar reach the second tier. “I want to get promoted- we all do. That’s my role, that’s my job,” the New Zealander told the Carluke Gazette. “When I first took the job on two years ago I wanted to be promoted. “But I understood that logistically because of where Biggar is, it’s tough to invite players to come players for the club. Mercer, 52, has plenty of experience in coaching, having been the defensive coach at Glasgow Warriors for eight years - and also knows that the lure of Glasgow and Edinburgh can make it difficult for a club like Biggar to retain their best players. “My role when I started was to keep the majority of the quality colts at the club. “They were always being poached by Premiership sides from the big cities - Edinburgh and Glasgow. Although he hopes to keep the majority of youngsters coming through the club at Biggar, Mercer insists that he won’t stand in anyone’s way if the Premiership does come calling. The season gets underway on September 1, with Biggar starting away at Dumfries Saints before hosting Stewart’s Melville the following weekend. Mercer knows that the third division will again be difficult, and has had the players in pre-season for well over a month now. “There will be no easy games. Biggar have been back in training since June 19 - making them one of the earliest side’s to return from summer in the entire of Scottish rugby. “They are all fit guys. It’s for working on their skills and tactical practice,” Mercer added.